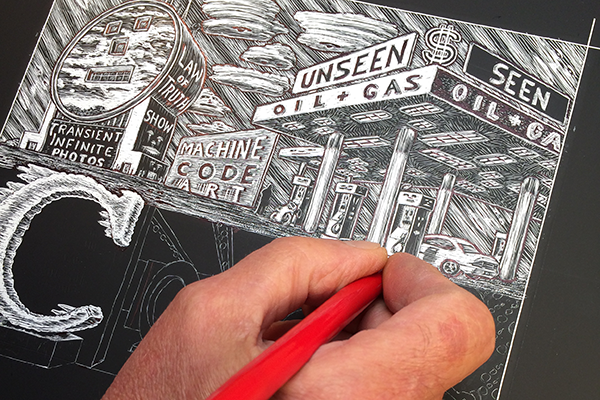 Gather your drawings and get ready to transfer your imagery into scratchboard illustration. Learn the basics of this accessible direct engraving technique in this one day workshop. Now in it’s 24th year, the festival is one of the largest book events in the world! The event where story telling and pop culture collide. Interact with the creators of content that influence everything we read, hear and see. I will be presenting and discussing my graphic novel PILGRIM’S PROGRESS at The Ninth International Graphic Novel and Comics Conference 2018, June 27th – 29th, Bournemouth University, UK. The theme of the conference is Retro! Time, Memory, and Nostalgia. My paper is Traveling through Time 1678 To 2018: John Bunyan’s The Pilgrim’s Progress: A Graphic Novel Adaption for the 21st Century. 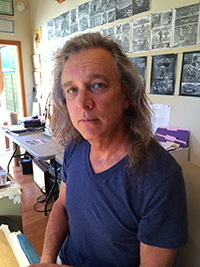 In telling the story I chose to follow the wordless pictorial narrative approach used by Lynd Ward in 1920s and 1930s. My challenge was to re-cast the text-only novel into an (almost) image-only graphic novel. I used a series of illustrations to present an unambiguous message which imparts emotional impact to this old story. I wanted memorable characters and scenes with which readers today could quickly grasp the timeless narrative in the original novel. Words – instead of full sentences – are part of the landscape. My graphic novel has now been published by Whistle Key Books and is currently for sale at www.bookshopsantacruz.com. I had a booth at the Alternative Press Expo at the San Jose Convention Center in San Jose, California, October 8-9, 2016. I showed my graphic novel at the Silicon Valley Comic Con in San Jose, California, at the San Jose Convention Center March 18-20. My artist table was well attended and I received great feedback on the books, images and content. I presented my “Pilgrim’s Progress: a Graphic Novel” at the Sixth International Graphic Novel and Comics Conference / Ninth International Bande Dessinee Conference in June 22 – 26, 2015, at the University of London Institute in Paris (ULIP). From their earliest manifestations, comic art characters have travelled the globe and beyond. 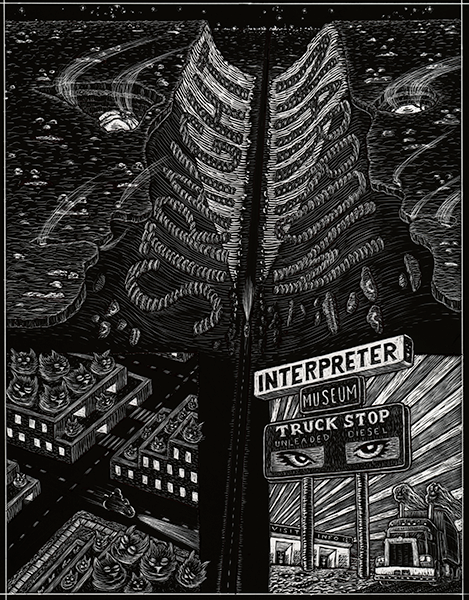 Whether realist or fantastical, drawn to educate or to amuse, comics have used their considerable and unique expressive power to depict journeys, both physically and mentally, to “elsewhere.” As the medium has evolved worldwide into one attracting both an adult and a juvenile audience, this relationship to the voyage has diversified, as recently-developed trends such as “graphic journalism” attest. This conference will focus on the relationship of the sequential art form to the voyage and study representations of travel across the history of the medium up to the present day. The conference intends to consider the notion of “voyage” in a broad sense, to include related notions concerned both with geographical movement – such as migration, exile or deployment – and with the psychic or temporal journey. It was an exciting follow-up on my presentation at the 3rd Global Conference on the Graphic Novel, held in September 2014 in Oxford, England. I presented my graphic novel at the 3rd Global Conference on the Graphic Novel held in Oxford, England. I have always admired wordless graphic narratives, editorial cartoons and illustrated characters of all ages in comic books and in classic literature. So I was inspired to create a graphic novel of John Bunyan’s 1678 Christian allegorical text “The Pilgrim’s Progress”. I have a Bachelor of Fine Arts from Texas Tech University and a Master of Fine Arts from East Tennessee State University. My teaching experience is at the college level for many years in the South and in Appalachia – the area of the United States with the richest traditions of storytelling and folk art. These forms came with Scots Irish and Irish settlers and have had a strong influence on me. In the past few years I have been creating my own way of storytelling using a graphic novel approach. My current work on Pilgrim’s Progress is really just storytelling. My goal with this graphic novel was to use a series of illustrations that present an unambiguous message which impart emotional impact to an old story, Pilgrim’s Progress by John Bunyan. I wanted memorable characters and scenes with which a reader today could quickly grasp the timeless narrative in Pilgrim’s Progress. I chose common, everyday words and phrases that transmit the message with a high level of immediacy. They reflect our present technological age in which all resources are always open for search and acquisition, where everything in life involves a monetary transaction and where we are constantly in touch with new creations. Everyone is always online either literally or in some other personally chosen or socially inevitable sense. John Bunyan’s story reflects an English view on humanity 337 years ago. I feel that people are basically the same today, although technology certainly has changed. The original storyline still has meaning through its societal and biblical references that highlight the common thread of the human experience. Pilgrim, the motorcyclist, is my everyman. Visually, he is usually secondary to other characters and the settings, but he functions, nevertheless, as the unifying element of the storyline; we are on his journey. He travels a road in a near future as I imagine it and I make observations on the economy, labor, politics, religion and war with each frame and page. He is, like Christian in the original story, traveling because his name has been called, and he knows he has to go. Staying in “Destruction City” will accomplish only what that city is named for: It will destroy him. 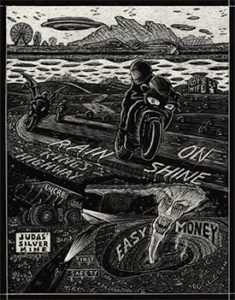 The Pilgrim travels the “King’s Highway” by motorcycle; the route is lined with doors to “Hell” in cities, shopping malls, gas stations, churches and farms. Each crossroad shows the various fates should a wrong turn be made. The road eventually leads to “Home”: from the “Temporal” to the “Eternal”. I create initial sketches and reference-check using the original story as my guide. Next I do concept renderings by drawing each page in full detail – in pencil, with shading – on tracing paper. I then start the scratchboard illustration on a piece of hardboard covered in a clay layer that is coated with ink. This provides a strong black and white image for the story. This drawing technique looks similar to work done with woodcuts and etchings. I follow Gustave Dore in using parallel lines to indicate value and I am influenced by Lynd Ward’s wordless pictorial narrative books with his unusual cinematic perspectives and dramatic lighting. Finally, strong contrast provides a noire tone to the story’s unfolding. To incorporate the narrative into the landscape, I combine isolated words, symbols and images together and place them into the visual field. This results in an integrated and entertaining visual representation of my story’s ideas and messages. I use the composition of the page to afford extra space to certain words, thus indicating their emotional breadth. When a symbol or metaphor is important to the theme, it is enhanced by its physical scale. For example, Pilgrim’s name on the first page is drawn in an emphatic visual style that emphasizes the importance of the fact that he has been “Called”. Narration lies prominently within the architecture and everyday-world objects in the story images. These are presented on surfaces on which I use words or faces which transcend the physical world and portray a wider vision of awareness. I use provocative images accompanied by highlighted words to engage the reader. Words are physical elements in my illustrations. I intentionally use the scenic buildings of the illustration to place significant words as they would appear on a rural road sign or a business sign. Words placed in the everyday landscape of the images appear more important and meaningful by virtue of that unfamiliar placement. Common sayings and figures of speech transcend their literal meaning by being presented out of their more familiar context. My extensive use of widely varied backgrounds and changes of perspective within the individual panels provides the platform on which the characters can move the story line. Multiple panels sequenced together on single pages provide strong continuity with a cinematic flow. The passage of time during Pilgrim’s struggles and progress is followed with day-to-night shifts and with sky and shadows of the events trailing behind him. Ancient stories were assembled using phrases that have been stockpiled from a lifetime of hearing and telling stories. All stories undergo changes; adaptations are kept alive and continue to find audiences. Now we may be at a crossroad where Everything intersects with an autonomous Global Intelligence. Technology contains no programmed moral direction, only the intent of the people controlling its power. If we were to assume that living organisms are a type of machine, then the machines must be a form of mechanical life. As Life constantly adapts and evolves so do the machines. Programming self-regulating powers into machines can lead to machines with self-acting powers. My graphic novel sets illustrative metaphors, words and symbols that express anxiety that we may not be able to control machines we have created with God-like ability. The Pilgrim’s enigma is: Can he accept what he cannot see as real, all powerful and not in his control, or is it just Technology that is all powerful and in control? Visual metaphors compare place, person or concept by use of an image that is similar, suggesting comparable qualities. One image is the target and the other is the source. This is common in editorial cartoons, advertising and cartoons. Advertisers know consumers are growing more competent in understanding and interpreting visual metaphors. In my story, I want the main ideas it embodies to be exactly interpreted. My goal is to be true to Bunyan’s story but updated so it is understandable by today’s reader. Moralizing like William Hogarth is not my goal. Presenting the story’s intention directly to the reader with words and symbols drawn in a realized world projects an emphatic message. Pilgrim’s journey is filled with everyday conditions of the common man. The world created for Pilgrim has a salient vitality, but that is accompanied by haunting reminders of the harsh realities of current events and our consumer society. This allows the reader to recognize emotional and intellectual depictions of these woes in the story: “Vanity Fair’s Superstition Mall” will sell you Anything but only buys the Truth. Want to sell your real Soul, for starters? Symbols and metaphors presented through a combination of words and images are my main devices for weaving the storytelling narrative in a way that encourages the reader to make their own judgments. A symbol can embody a universal truth and a metaphor can create a link between distinct conceptual domains that must be brought together in our understanding if we are to make the most productive choices the story’s journey presents to us. 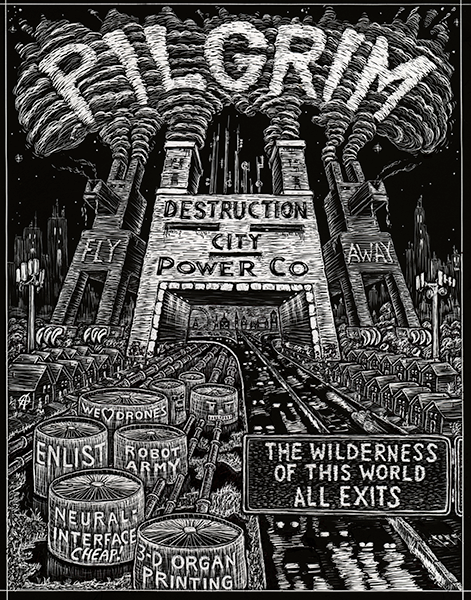 “Destruction City” is a place that will destroy you if you stay along with the Meek, Rooted and the Hopeless. “The Straight and Narrow” is a canyon and a way of life chosen to keep you on track for your journey. Names give immediate reference to the image’s symbolism or metaphor. Our customs of daily life are filled with usage of both. Symbols show the idea of the truth but not the truth itself, and, thus, must be seen as pointers to the truth. Metaphors are used to persuade the reader to subscribe to the writer’s argument through the recognition of similarities, parallels, and illusions, among other connections. My “Wise Advice” character asserts that you can get yourself drunk on “Faith beer” and buy “Walk Heavy brand guns” that are named for the cornerstones of Western Civilization: Civility, Morality and Legality. Then you can purchase ammo named “CRACK DOWN” or “WRONG ANSWER“. 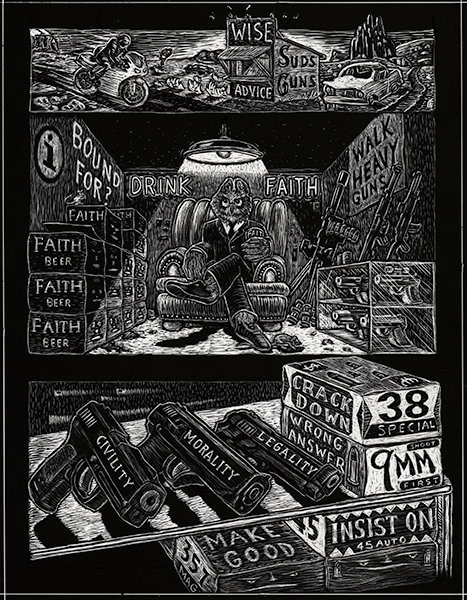 These embody an excuse to shoot someone – by reason of the three enforcement issues branded on the weapons – while drunk on FAITH beer. And where are you BOUND FOR? Interpretations are not inherent in either image or words but arise for the reader’s exposure to cultural references upon which the reader has been brought up. My love of folk tales of the American South is evident in this allegory. Personification arises from our innate ability to see the impression or suggestion of human attributes in nonhuman things or events. Religions, fables and all forms of cultures use story telling in this manner. The purpose of employing an imaginative character or talking animal to tell a story is to arouse curiosity about another being’s world which engages the reader’s interest. Anthropomorphic images make the story more humanly understandable and memorable. All images open the door to the subconscious requiring interpretation of what exactly one is looking at and being told. The world is enigmatic and equally open to productive or destructive possibilities; you have to choose your options wisely. People understand events when the rendition of them has a strong narrative and coherent story that gives explanation to everything presented to the reader. A good story is one from which you have gained retention of past events, is alert to the present, and one that anticipates the future. That you will reach that “Last Breath River” is a certainty; it doesn’t matter whether you sink, swim or ride the ferry – because there is no rescue. You had to decide earlier in the journey to get chips at the Beulah Salvation vending machine–PAY ATTENTION!–in either Euros or Dollars. Unconventional ideas, figures of speech, humor, common day-to-day speech and artistic skill combine in this work to allow me to objectify in drawn imagery an emotional or humorous world that transcends literal meaning. I hope this presentation provides emphasis and clarity to the story’s message. However, I am aware that ambiguity perceived between the literal and the figurative representation can obscure an artist’s intensions. 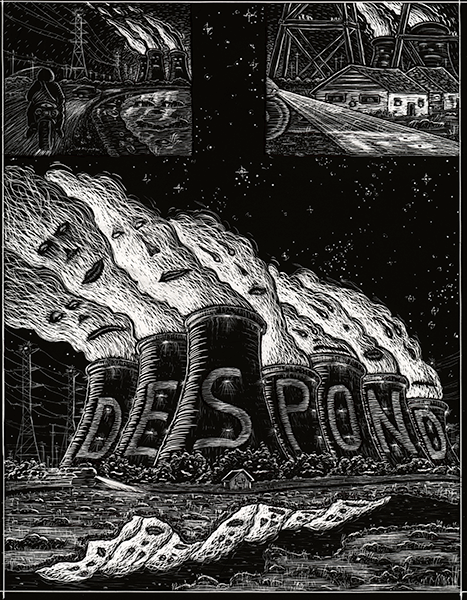 On the Page 5 of my graphic novel, for example, “DESPOND” written on cooling towers crowned with gigantic steam faces stares despondently down at Pilgrim and the slough. The little house stays there forever; Pilgrim is only passing through. That is my intention, but the reader may interpret differently, depending on his or her cultural frame of references. Still, revealing truths in imagery that is relevant to the human experience makes the reader more likely to be interested in and to continue being engaged with the story. All I can do as an Artist and Story Teller is to hope all my devices and skill called upon to construct this graphic novel will hold and maintain the reader’s interest through its entire content and presentation. Every page is a visualization of metaphors, symbols and vividly rendered landscapes filled with narration. Only a profound story can be meaningful enough to influence decisions in a person’s life. The story of a world trying to show its inhabitants the Way to Heaven is such a tale. I am seeking a literary agent who works with Graphic Novels and would be interested in representing me to find a publisher. I am also seeking a Publishing House to carry this book to a print format. My work is in finishing stages of illustrations being rendered.